Agencies across the federal government, including the entirety of the Pentagon, are making a significant push toward adopting Microsoft Windows 10. Driven by the need for greater standardization and security, adopting Windows 10 could eliminate confusion and complexity across agencies’ IT enterprises, particularly with device management, and make it easier to protect against emerging cyberthreats. That, coupled with the upcoming end of support for Windows 7 by 2020, make the move to Windows 10 so important for many agencies. Ivanti has released the Top Ten Tips for Windows 10 Migration as public-sector organizations increasingly migrate to the operating system. 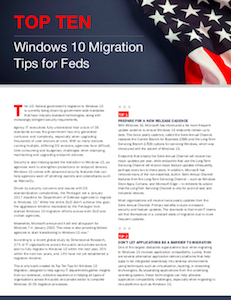 The 10 tips are designed to help executives plan their migration to Windows 10 based on Ivanti’s experience helping a large variety of organizations from the public and private sectors in the move. Ivanti covers all of the topics agencies should consider as they move to Windows 10, including picking an OS deployment strategy, planning for a hybrid environment and stopping malicious or unlicensed applications. Read all of Ivanti’s tips for your move to Windows 10 in its Top Ten Tips for Windows 10 Migration special report.